If you have been on a mission trip before, you know that you travel with two suitcases: One for your personal belongings (and it’s suppose to fit in the overhead bin on the plane) and one for the mission work. 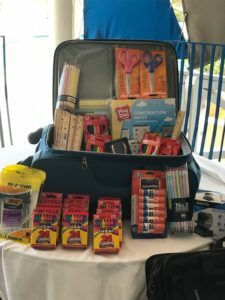 Our mission is directed toward the education of children, so we often have a suitcase filled with crayons, pencils, glue, scissors, and markers… items generally not available to students in third world countries. Often, it’s a challenge to transport this additional luggage: weighing it so that there is no extra charge, lugging it from your house to the airport, ‘hoping’ it shows up on the carousel at your destination airport, fitting it into the van that shows up to transport the entire team and all the luggage to the mission site. Yet, despite this additional baggage burden, nothing beats the joy on the faces of children (and teachers) when they receive these precious gifts our donors collect for them! You always wish you could bring more. Romans 10:15 declares “How beautiful are feet of those who bring the Good News” … I think it’s okay to add their extra suitcases to that verse as well!